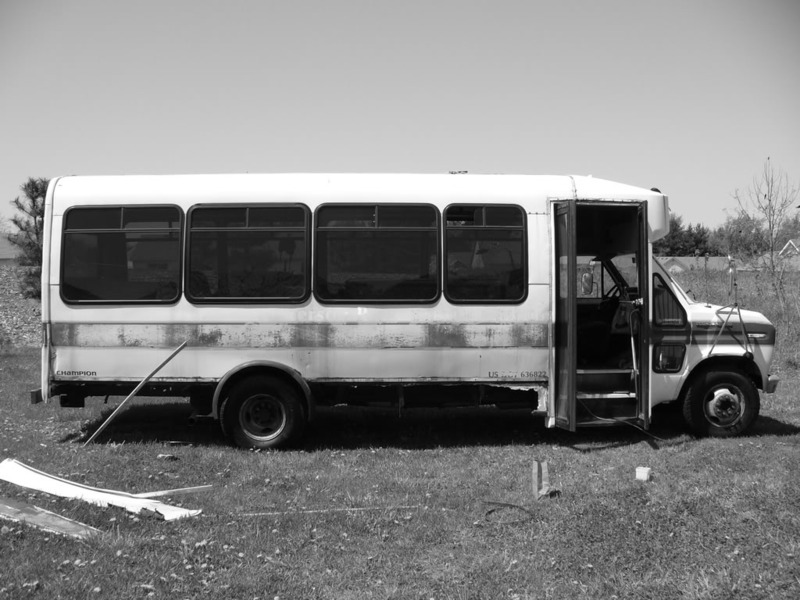 Before April 21st I had been doing research, pricing out and test driving short buses and the such. For some nefarious reason I have got this idea in my head that I want to convert a bus to take to concerts and ND tailgating. So the size was one of the issues as well of price of course. I found a hell of a deal on a church shuttle bus on EBAY. April 21 Crystal drove me up to Niles MI in the Turd to pick up the bus and follow me home since we never test drove it or anything. It drove really good, shifted well and brakes seamed to be fine. 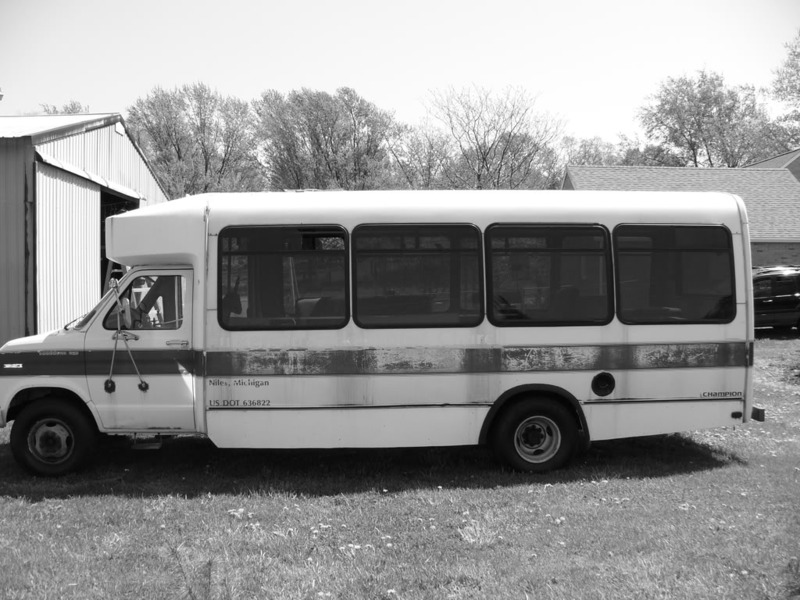 The tires looked brand new except this bus had been sitting since 2003 and the tires were dry rotted. April 22 I took it to Elbodes in search of some new used tires and was able to replace the front two which I thought were the worst ones. Boy was I wrong! On the way home I herd a sht sht sht while driving shich almost sounded like a sprinkler. I new it was air coming out of the rear so I took it straight to zolman tire and the quoted me $150 to replace it and they couldnt do it because they were closing. They also told me since it was one of the dually's to be careful because it could blow the other one out due to them rubbing together. I got it home and parked it. April 23 I drove to the BMV to get the License and title transfered. They tried to tell me I needed a CDL to drive it. I pleaded with them that this will not be used for passangers and just recreation. She decided to give me a bus license with a NOT FOR HIRE sticker on it. She tired to give me the license but the state never releassed them for sale. So I had to wait as we all have in the BMV for 1-1/2 hours for plates. Than I called Elbodies and asked if I could try to find some more tires and they said sure. So I went digging through there mound of tires and eventually found three. That means I have all but one tire mounted and balanced for $120 dollars. April 24 I started tearing out the ceiling which was a ******* mess!. I discovered that some of the luan board was damp as I was tearing it out. I had an idea wear it was coming from but not 100%. 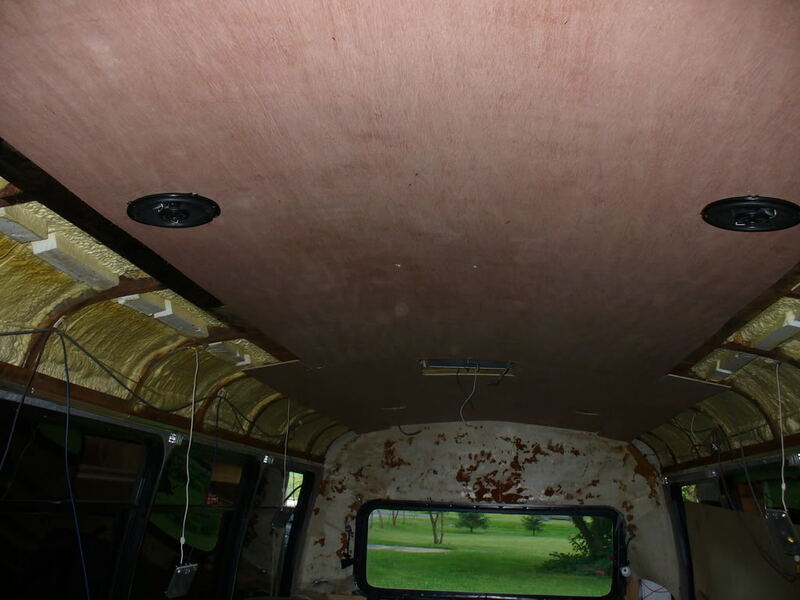 I also noticed that they had sprayed the ceiling with insulation foam, which is nice. It will keep it insulated when needed. 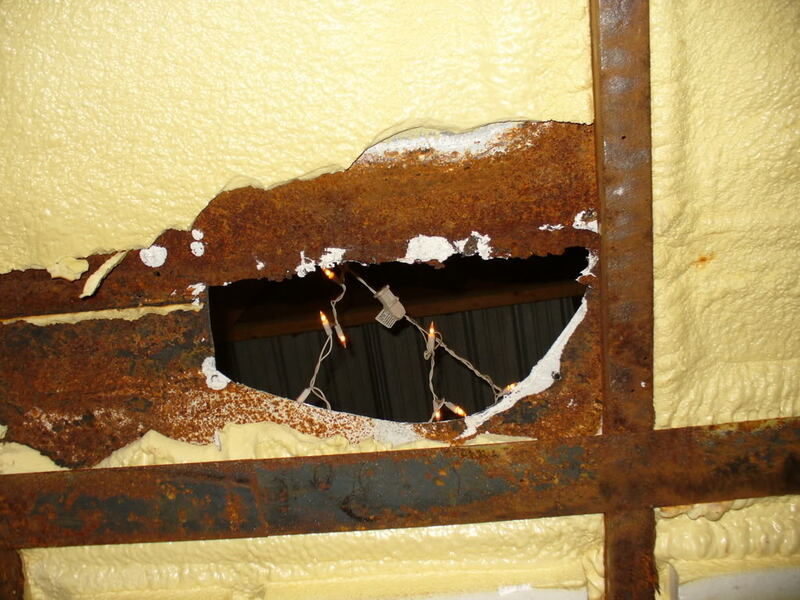 It seams that all of the support beams had surface rust on them too. It is now June 17 and I have not added many updates in awhile so here it is. The bus was moved out to my dads where I have more room to work on it. I have removed the lower side panels by the wheel wells due to a master hack job of fiberglass over rotted metal which looked like ****. 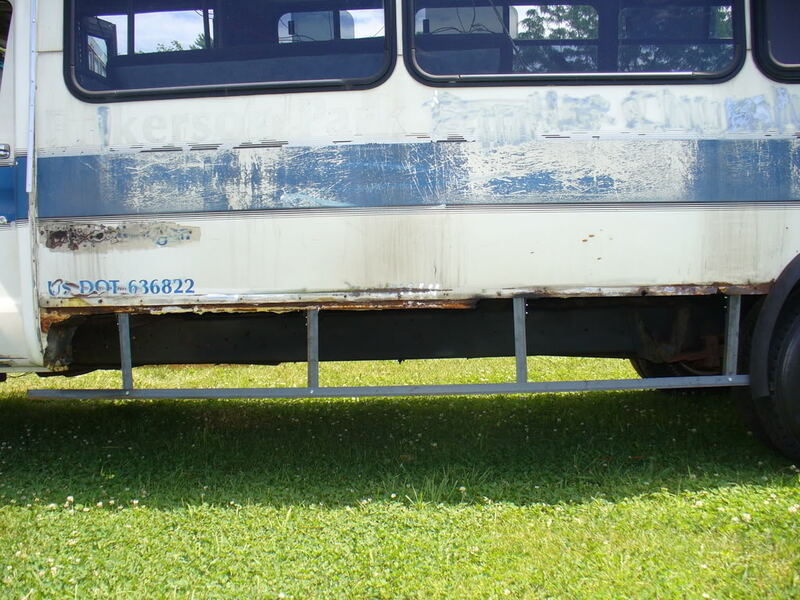 I made new supports with angle iron and am ready to reskin the lower section of the bus sometime this week. I will be adding storage space in this lower section as well and plan on putting my home battery arsenal down in this area when I get around to it. As I was working on the roof actually masking it for a few coats of Kool Seal, my knee went through and made a hole. in the picture you can slightly see the seem which water must had penetrated and made weak down the whole damn thing. 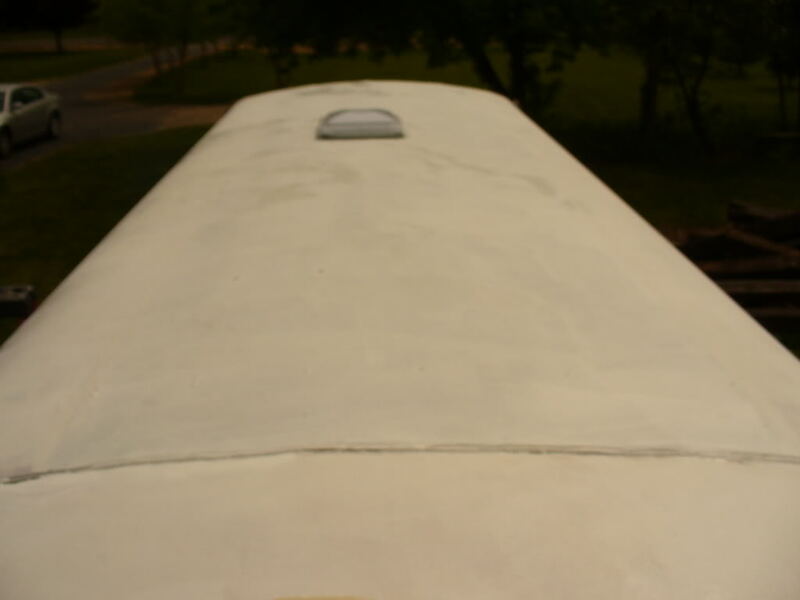 Their are two seams running down the outside middle of the bus that had caulk on them an I had been kinda weary about. Well sure enough right before I am trying to seal the damn thing I go through. I am actually glad that this happened when it did though. I got 2 4 X 10 sheet of steel and 4 tube of water cutoff which is nasty as hell might I add. The water cutoff makes an elastik seal which never dries out (my jeans have been through the washer and dryer and the **** is still sticky lol). I did an overlay after I treated all the rust and sealed with the water cutoff. 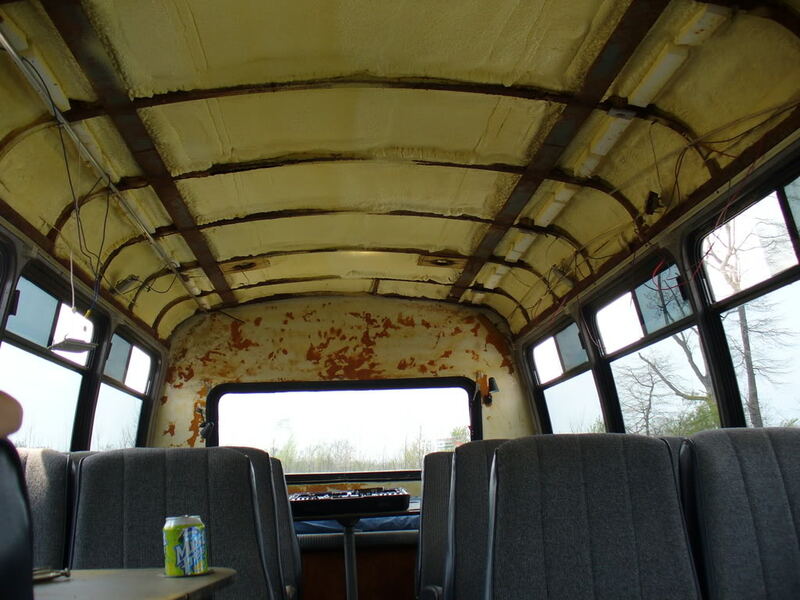 I riveted the sheet metal to the steel frame of the bus and some self tapping screws where needed. I also added a vent with fan just to add some circulation for the long stops. The inside ceiling has began getting covered by luan wood and I have yet to find a covering scheme for the interior so that has been put on stand still. I have discovered that the making of these buses under the skins looks like **** and there welders weld like 3 graders. I have ran all new speaker wire, electric to the fan, new cd player, working on a touch screen jukebox (powersupply) reverse camera that can withhold the weather and is usb capable.